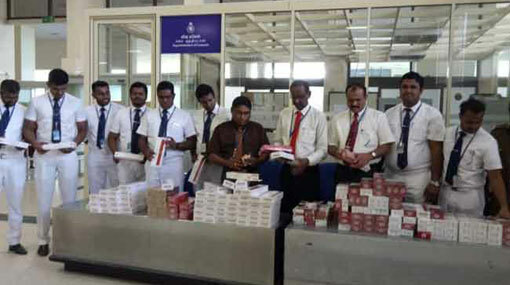 The Customs officers attached to the Bandaranaike International Airport (BIA) have detained a Sri Lankan passenger along with 29,000 foreign-manufactured cigarettes. The 41-year-old passenger had arrived from Dubai at around 8.35 a.m. this morning (12) and was held at the Green Channel of the airport. The contraband, which was contained in 148 cartons, is estimated to be worth over Rs 1.6 million, Acting Customs Media Spokesperson Vipula Minuwanpitiya said. The detainee is revealed to be a resident of Minuwangoda area. Further investigations are carried out by the Customs officers attached to the BIA.